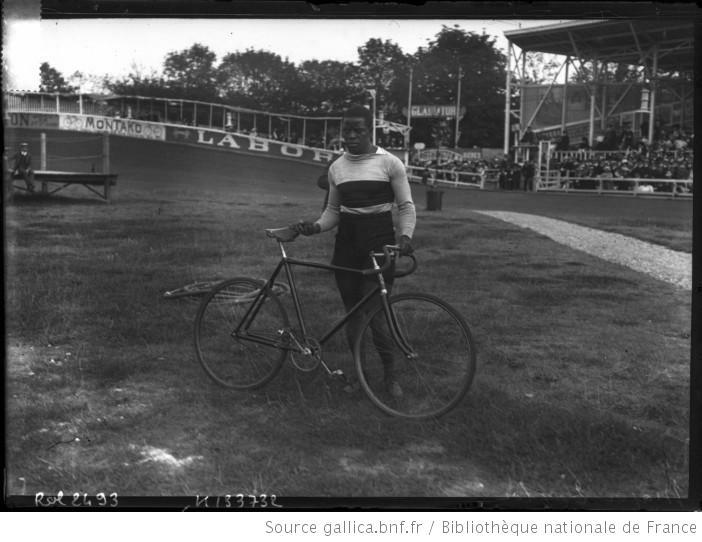 Major Taylor in France in 1908 (image wikipedia via Bibliotheque Nationale de France). Last week The Grio examined the impact of the color line on contemporary cycling, a discussion that reaches back to cycling’s primal 19th-century moments. On the one hand, there is an enormous amount of evidence confirming that American cyclists have always included people of color, and a 2013 study on cycling and diversity confirms that cycling’s demographics reach well beyond the caricature of lycra-clad White bourgeois. The Grio’s article covered familiar ground, and it could well describe nearly any collective of riders attracted to cycling for its health effects, competition, and sociality. On the other hand, though, myriad cycling clubs, national advocacy groups, and the elite levels of American cycling underscore the way the color line persistently shapes the mundane realities of bike riding. The discussion of race and cycling reveals deep-seated anxieties about diversity in cycling circles, and it reaches from the elite levels of the sport to grassroots recreational riders. The discourse on color and cycling is not at all unique; instead, it is symptomatic of everyday racial divides reaching from sport to houses of worship that Americans have historically ignored or avoided. In February, 1894 the League of American Wheelmen met in Louisville, Kentucky at the height of the 1890’s cycling craze. The League counted 36,567 national members when William Walker Watts rose to speak in favor of a change to the League’s constitution. The lawyer and former Confederate Colonel had lobbied for several years to restrict the League’s membership exclusively to Whites, even though by even the most optimistic count there were no more than a couple hundred Black members. The Boston Daily Globe included this image of Taylor in its pages in 1897 (image wikipedia). Many local clubs joined the League in their color line exclusivity. Indianapolis’ Zig-Zag Cycling Club, for instance, was founded by Arthur C. Newby in 1890, the same year he established the Indianapolis Chain and Stamping Company (still making chains today as Diamond Chain). Local cyclist Marshall “Major” Taylor was among the Indianapolis riders barred from the White-only club. In 1895 the 16-year-old Taylor joined the newly formed African-American See-Saw Cycling Club, and the club held its first race on Labor Day 1895, at which Taylor won a five-mile race against the “St. Louis Flyer,” Henry Stewart. Taylor moved to Worcester, Massachusetts a year later and received death threats as he raced to victory throughout the country; even when he later moved to the Columbus Park neighborhood in Worcester his neighbors opposed Taylor’s residency. In 1897 Taylor was nearly choked to death in a Massachusetts race after being thrown to the ground and strangled by unhappy loser William E. Becker. Taylor held seven world records in 1898 in distances ranging from a quarter-mile to two miles, but between 1901 and 1909 he competed almost exclusively in Europe, effectively ending his career in the US. The actual effect of racial exclusion codes more than a century ago is complicated. William Walker Watts’ optimism that thousands of Southerners would flock to the League of American Wheelmen when it became segregated did not come true. By February 1895 the New York Times reported that the League membership had fallen by nearly 10,000 members, and the Massachusetts delegation moved unsuccessfully to reverse the racist exclusion. There is little evidence that the racist codes were ever especially vigorously patrolled. Nevertheless, it is difficult to appreciate the chilling effect organizations’ exclusions had on subsequent cycling groups. Renamed the League of American Bicyclists in 1994, the former League of American Wheelmen met in Louisville again in 1999 and finally officially repealed the Whites-only membership rule. The League had long ago become an advocacy group rather than the organization administering the sport, and the League routinely is cited for its advocacy on behalf of the good roads movement. The dilemma of segregated cycling advocacy groups is that many cycling voices remain under-represented as bike paths instead wind into middle-class suburbs or politicians simply write off cycling—and many urbanites’ primary transportation–entirely. The highest levels of elite cycling still include few people of color. To attribute this simply to the cost of cycling is at best only a dimension of the challenge. Equipment cost is a genuine barrier to elite cycling, but football equipment is not inexpensive, and football leagues dot the nation and reach into many under-represented communities. In 1920, the Amateur Bicycle League (merged into USA Cycling in 1995) began to administer elite cycle racing in the US. USA Cycling is the national governing body for bike racing and runs developmental camps for future elite cyclists, but in 2010 they told The Grio that they do not even monitor minority cycling patterns; consequently, they do not appear to have a quantifiable or concrete social analysis of cycling and the color line. The blog Cycling in the South Bay unloaded on USA Cycling in April 2013, identifying its undistinguished record on diversity and poor record promoting Black cycling, proclaiming that “USA Cycling hates black people.” The pronouncement may seem rhetorical, but the sport’s elite levels remain segregated, and the sport and recreational cycling alike are weakened by the absence of a broader range of riders. Some African-American cycling groups have emerged to fill the American advocacy voice, including the National Brotherhood of Cyclists; the Major Taylor Association; the Major Motion Cycling Club; and a host of grassroots groups. That advocacy has reached to the facebook group The Black Cyclist, and the film RIDE: In Living Color proposes to tell the stories of African-American cyclists in California (see the description in The Bicycle Story). After being perhaps the most dominant cyclist on the face of the planet for the first decade of the 20th century, Major Taylor died penniless in Chicago in 1932, living his last years at the YMCA and the hospital’s charity ward before ending in an unmarked pauper’s grave. Taylor’s body was rescued from that anonymity in 1948, when Frank Schwinn had Taylor’s body moved and marked. Today Taylor’s name graces the Major Taylor velodrome in Indianapolis, as well as a street in Worcester, and Taylor became a member of the Bicycling Hall of Fame in 1989. A bike might seem the most democratic of all machines, unable to be touched by color or class xenophobia. Yet it is impossible to understand a bike itself without understanding a complicated network of heritage and xenophobic (if unexamined) social presumptions. 1893 Editorial. The Bicycling World 7 April:85. 2008 Vails salutes Major Taylor: World-class cyclist to help honor Worcester legend. Telegram & Gazette 18 May: A.1. 1971 Progress and flight: an interpretation of the American cycle craze of the 1890s. Journal of Social History 5(2): 235-257. 1893 Among the Wheelmen. New York Times 16 August:6. 1894 The Color Line Declared: Negroes not Eligible to League of American Wheelmen. New York Times 21 Feb:6. 1895 League Membership Decreasing. New York Times 5 Feb: 7. 1895 Strike out the Word “White”: Bay State Cyclists in Favor of This Change in the Constitution. New York Times 5 Feb:7. 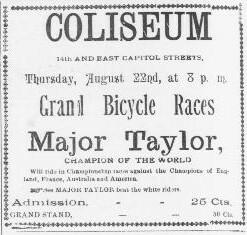 1903 Major Taylor in Australia: Winning Races and Preaching — Cycling More Lucrative Foreign Correspondence. New York Times 16 February: 10. 1988 Major Taylor: The Extraordinary Career of a Champion Bicycle Racer. Bicycle Books, San Francisco, California. 2011 Lecture, US Bicycling Hall of Fame. 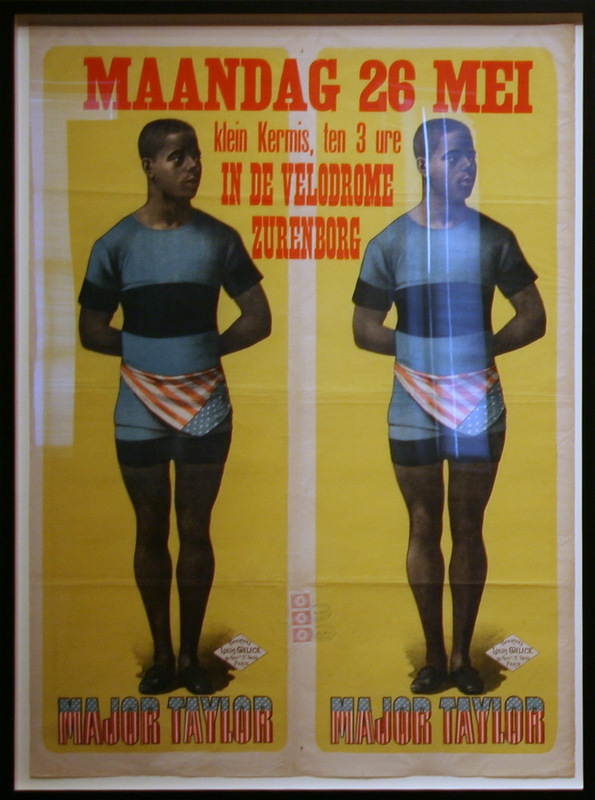 1929 Fastest Bicycle Rider in the World: The Story of a Colored Boy’s Indomitable Courage and Success Against Great Odds. Self-published by the author. 2006 A proper tribute; Major Taylor Boulevard honors cycling champ. Telegram & Gazette 25 July: A10. Major Taylor 1901 advertisement from Chronicling America, originally appeared in The Colored American August 17, 1901:16. Posted on September 30, 2013, in Uncategorized and tagged #WPLongform, cycling, Major Taylor, race. Bookmark the permalink. 1 Comment.